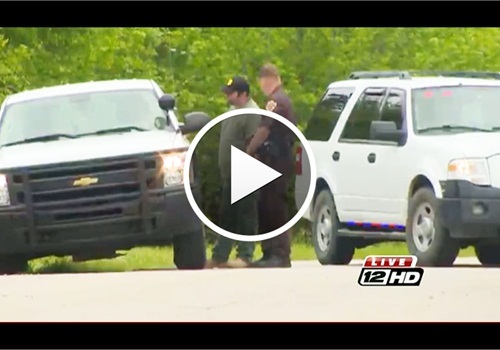 Two law enforcement officers were shot and the alleged shooter, Joseph Leroy Potts, was killed Thursday when officers from several agencies were in the process of making an arrest in the unincorporated town of Rufe, Okla., reports KXI-TV. Oklahoma State Bureau of Investigation spokesperson Jenny Virden said a man there, who has now been identified as Potts, had fired shots at his neighbor's house. When the law enforcement officers arrived around 9:30 a.m., Potts allegedly set fire to his home and opened fire with a rifle on the officers, striking two of them. Officers returned fire, killing Potts. According to Choctaw County (Okla.) Sheriff Terry Park, Hugo (Okla.) Police Lt. Steve Babcock is in critical, but stable condition. Choctaw County Deputy Jeff Epley's injuries were not considered life-threatening.